Somewhere down the road in 2007 I suggested that the T-List members (a list of Travel related Blogs, see also my latest compiled T List counting over 250 Travel Blogs) should become more of a community and maybe post a weekly or monthly recap posts of posts they find interesting in fellow travel Blogs. Thanks to ever inspiring Darren Cronian of the Blog Travel Rants there is now a platform developing that makes this wish com true. 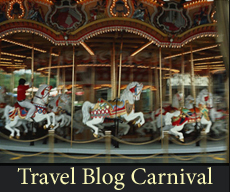 The Travel Blog Carnival. Thanks Darren! Great idea! Now there will be some real community growing between the Travel Bloggers! In his post It’s time for a Travel Blog Carnival! He launched this idea. Generally the idea is that every Travel Blogger e-mails his favorite posts to a central post and that on a weekly rotation basis one of 52 travel bloggers choses his or hers 5 favorite posts and publishes a short review of those posts. Cris Christensen of Amateur Traveler and Tripinator | Travel 2.0. To whom do I submit a post? And if I submit a post, will I get other’s posts to review? Not quite sure how this is working. Good idea, though.